Something has been eating our cucumbers. All summer we’ve been finding lots of cucumbers with what looks like small “bites” (but not quite the same) taken off the underside. We thought we might have a mouse or mole problem. We were wrong. A few days ago we picked a cucumber we hadn’t noticed before because it had been hidden by grass near the outer perimeter of the garden. This cucumber had obviously been sitting there for a while, and the inside had almost entirely been eaten away. 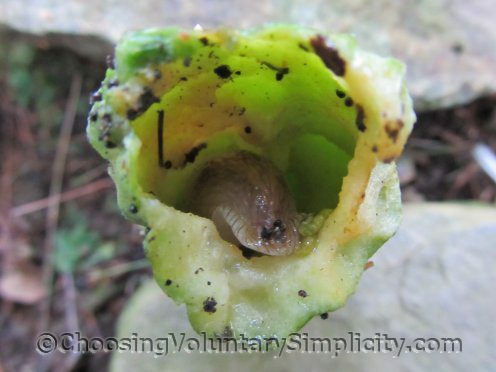 All that was left was a hollow shell… AND the giant slug inside that was still busily eating away. 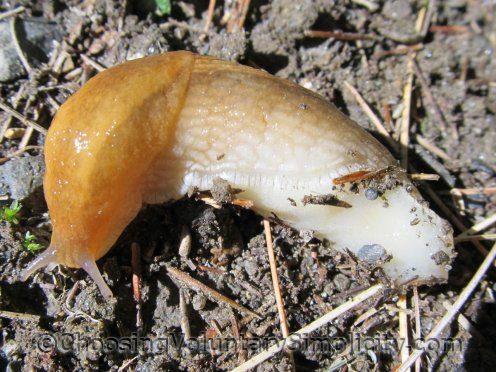 Usually I’m not at all squeamish with worms or other crawling things, but this more than three-inch long slug was so big and so fat, it was just creepy. It’s good to know we don’t have a mouse or mole problem. 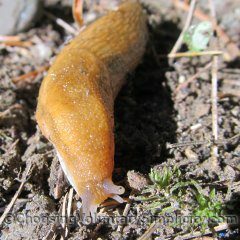 Not so nice to know we do have a slug problem, though. 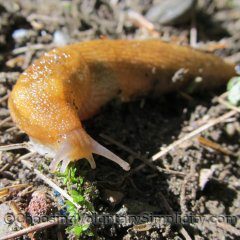 We a big snail and slug problem. 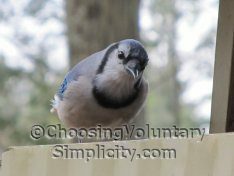 We also have pets that go in the yard…. Any tips for this that you guys are utilizing? Would love them. W did the egg shells, coffee grounds – no change in eating all of our plants and garden herbs. Have resorted to picking them off at night but am close to the Borax/Beer murder of them. Wish there was another way…..
Have you tried the beer trick? Pour beer in a somewhat shallow container and bury it to the rim. They crawl in and drown in the beer.